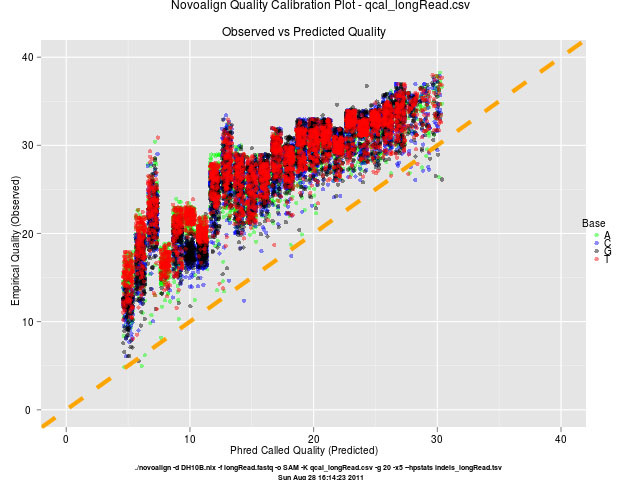 This is the first part of a planned three part blog series on Ion Torrent signal processing. In this first part I will discuss the important aspects of the background and foreground model using key mathematical equations and pseudo code. In the second part, I will outline the high level process of signal processing which includes the key parameters that must be fitted. In the final part, I will discuss the major assumptions and where the model breaks down. The goal of Ion Torrent signal processing is summarize time series data (Figure 1) into just ONE value which is then stored in the 1.wells file. The 454 equivalent is the .cwf files (thanks flxlex), however the difference is that Life Technologies has made their signal processing OPEN through the release of their source code. Without the source code, I would just be speculating in this blog series. So yay to available source code and kudos goes to Ion Community contributors Mel, Mike and particularly Simon for answering all my questions in great detail. Reads that must be filtered out due to poor signal profile*. This can account up to 30% of the reads as observed in the long read data set that was released. The resulting base call particular towards the end of the reads. There is only so much signal normalization and correction (covered in Fundamentals of Base Calling series) that can be performed. Therefore, improvements made will have the biggest effect on improving accuracy and increase the amount of reads. In other words, if you improve on this you can have ONE million dollars. You start getting used to the background sound and learn to ignore it. You know how your friend sounds like and focus on only the key words in the sentence. In reality though I refuse to try and instead nod my head away pretending to listen 😛 However, the Ion Torrent signal processing works on a similar principle. Figure 1A. 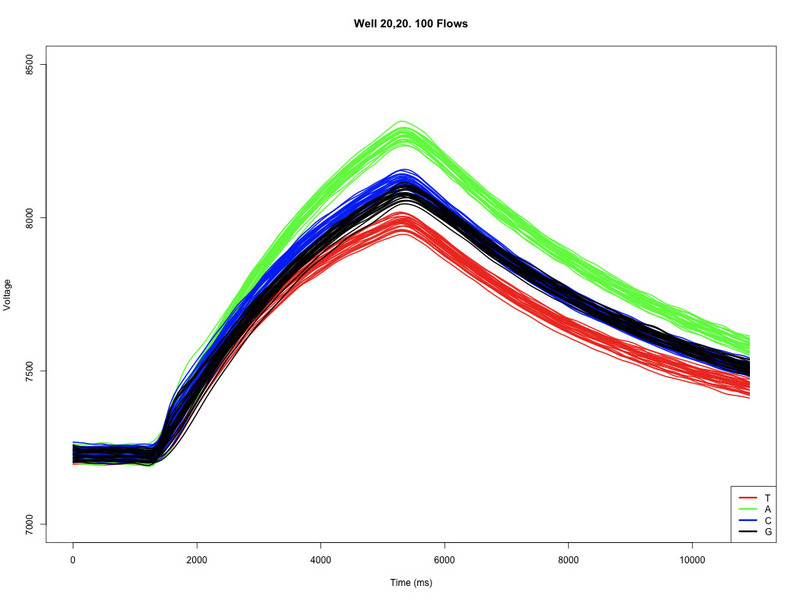 Uncorrected signal from the first 100 flows from a live well. 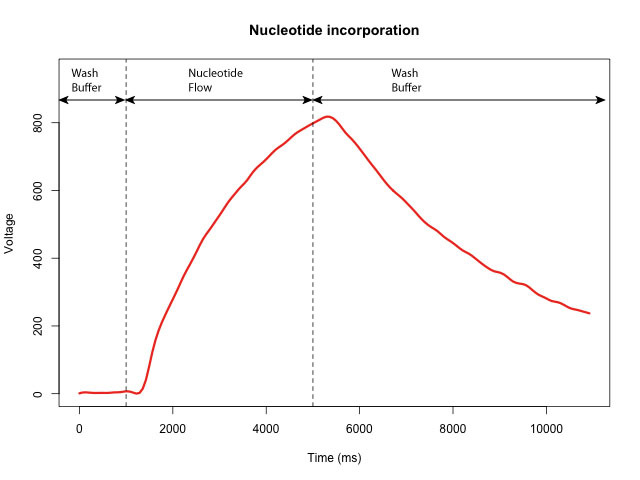 This was from a 4 flow cycle (Q1 2001) and thus 25 flows per nucleotide. 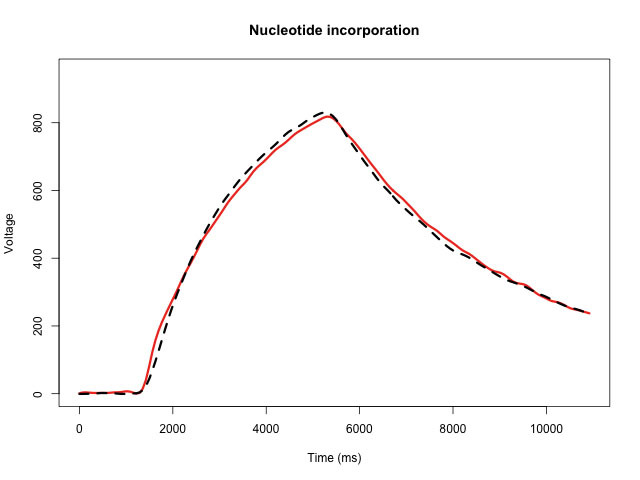 If you look hard enough there are small bumps between 1500-2000 ms that represent nucleotide incorporation. Figure 1B. A typical baseline corrected measurement from an occupied well (red) and an adjacent empty well (black). 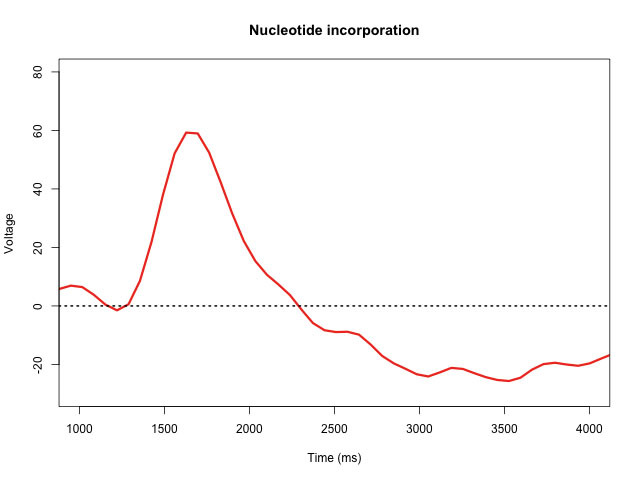 The tiny red bump between 1500-2000 ms represent a nucleotide incorporation. The background model aims to approximate how the signal will look like for a given flow if there was NO nucleotide incorporation. The problem is what to use as a point of reference. The best and intuitive source is a zero-mer signal from the well itself as this would encapsulate all the well specific variance and parameters. A known zero-mer signal can be taken from the key flows (i.e. first 7 flows). The only draw back is that each well is a dynamic system which changes over time due to slight variance in flow parameters and changing state of the system. Another possibility is to re-estimate the zero-mer signal every N flows. The problem with this approach is that later on there will be no TRUE zero-mer signal as there will be contributions from lagging strands. The surrounding empty wells are the only candidate left. The loading of a chip wells with Ion Sphere Particles is a probabalistic event and not all particles fall into wells. Due to the size of the particles and wells, it is physically impossible to fit two particles in a well. Therefore, a well should either be empty or have one particle in it. 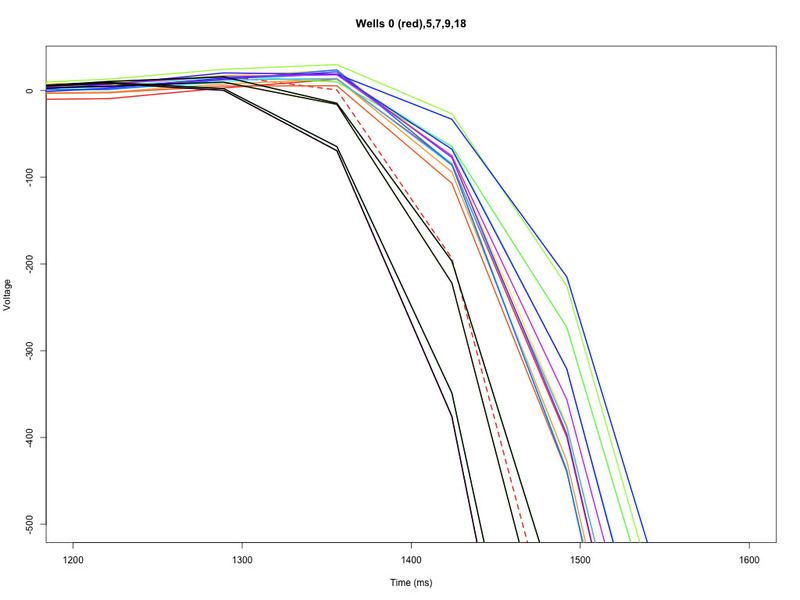 The way the Ion Torrent detects whether a well is empty or not is by washing NaOH and measuring the signal delay compared to its neighboring wells (Figure 2). An empty well has less buffering capacity and therefore should respond earlier than its occupied neighbors with particles. 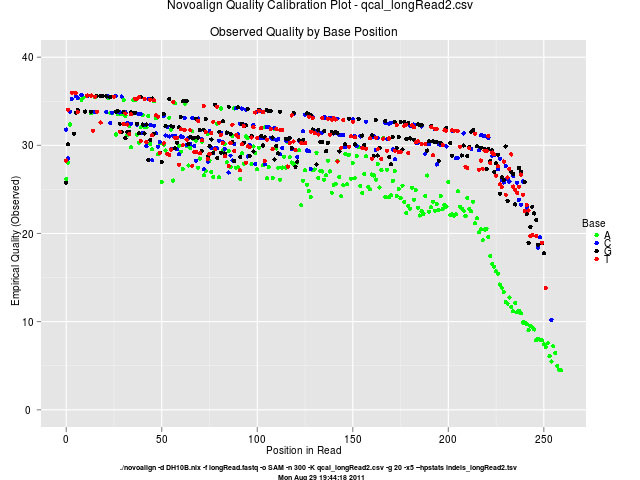 There is sometimes a grey area in between and the Ion Torrent analysis uses clustering to best deal with this grey area. Figure 2. The voltage response from the NaOH wash at the start to detect occupied and empty wells. I’ll explain in more detail in next blog post. The putative empty wells (colored black) respond earlier and much faster than occupied wells (rainbow colored). The well represented as a red dotted line lies in the “grey zone”, i.e. hard to classify as either empty or occupied. 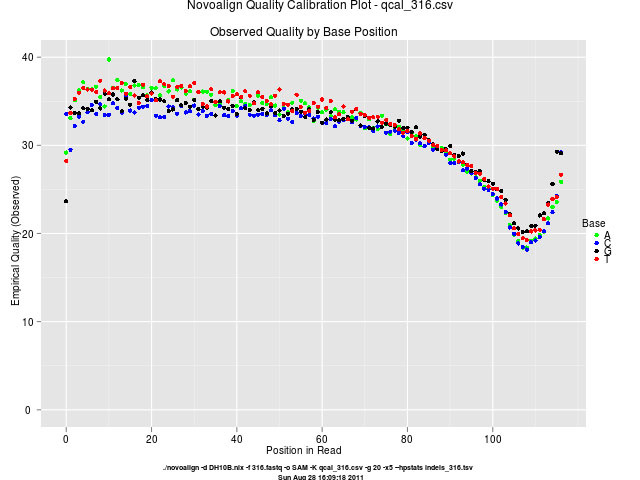 Measured average signal from neighboring empty wells (ve). This signal must be time shifted as it will be subtracted to leave foreground signal. 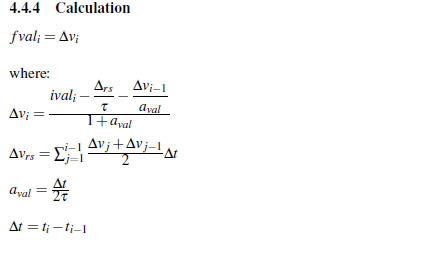 I will let the mathematics do all the talking below 🙂 This is a screen capture of a latex document I produced a few months a go so I don’t remember much 😥 Please note all equations are MY INTERPRETATION of the source code and since I didn’t write the code, I am probably incorrect sometimes. The Foreground signal is calculated by subtracting the background signal away from the measured signal for an occupied well. By using this model, we can determine the value A which represents the nucleotide incorporation value (aka uncorrected signal) that gets stored in the 1.wells file. During each nucleotide flow, the polymerase adds nucleotides in a relatively synchronous manner and therefore produces a combined signal for the well observed as a detectable voltage change. What I mean by “relatively” is that most nucleotides are incorporated soon after the nucleotide is flowed in, while some take a little longer to incorporate which is usually the case with the homopolymers . This looks like a sudden spike followed by an exponential decay (Figure 3). This foreground nucleotide incorporation is modeled as a Poisson distribution using empirically derived nucleotide base (A,C,T,G) specific parameters such as Km values (plagiarized from myself :lol:). Figure 3. Signal produced by subtracting an empty well from an occupied live well, (i.e. subtracting the dotted black line from the red line in Figure 1). The peak of ~60. 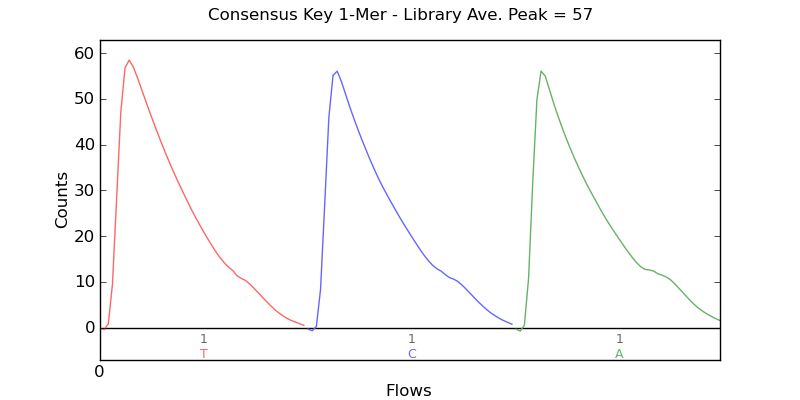 The average key flow peak in a typical Ion Torrent report is calculated in a similar way. This is from Q1 2011 DAT file so is not sampled at a more desired rate. The goal is to find A that best reduces the error. I will let the mathematics below speak for itself. In the next blog post for this series, I will list the major parameters used in signal processing. 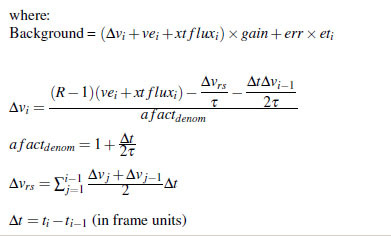 These are the mysterious unaccounted variables in all the above equations and also high level description on how parameter fitting is performed. Disclaimer: For the good of all mankind! This is purely my opinion and interpretations. I have tried my best to keep all analyses correct. The mathematical interpretation was done some time ago when I was in my “happy place”. Now I’m not in that “happy place” so don’t remember a thing! 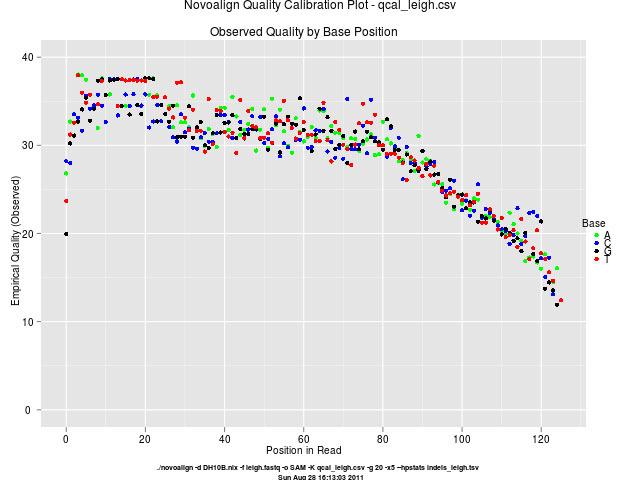 The analysis was performed using Novoalign in the Novocraft package (v2.07.12) according to the instructions detailed on their Ion Torrent support page. The plots were produced using the Rscripts provided in the package with slight modifications to change the look and feel. 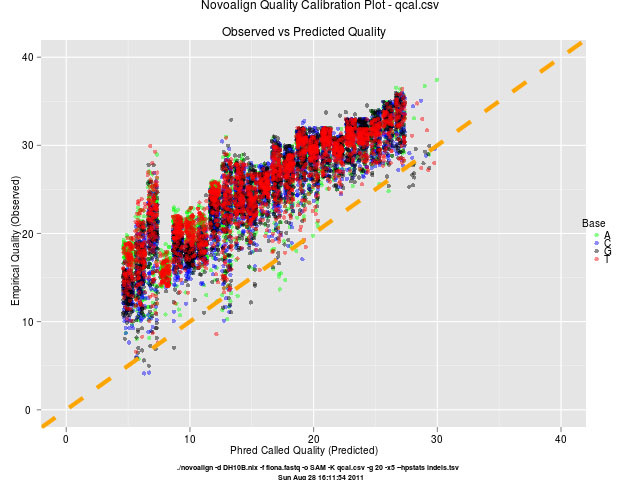 I used the fastq files as input and did not do any pre-processing to ensure the reproducibility of the data. The same command line options was used and is noted at the bottom of each plot. 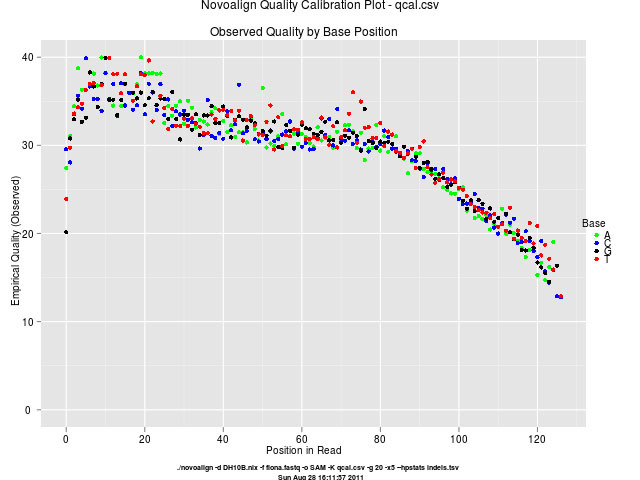 The only exception is the last plot for the long range data set where the “-n 300” option was used to inspect quality past the default 150 bases. Kudos to Nick Loman for the help (see Comments below). I quite like the package and the fast support provided on the user forum (kudos to Colin). There is a nice gallery of figures provided on their Facebook page. From the quality plots there are two very obvious things. First, the predicted estimation is overly conservative and they are underselling themselves by an average of 10 Phred points. This was noted also on the Omics Omics, EdgeBio and Pathogenomics blog posts. 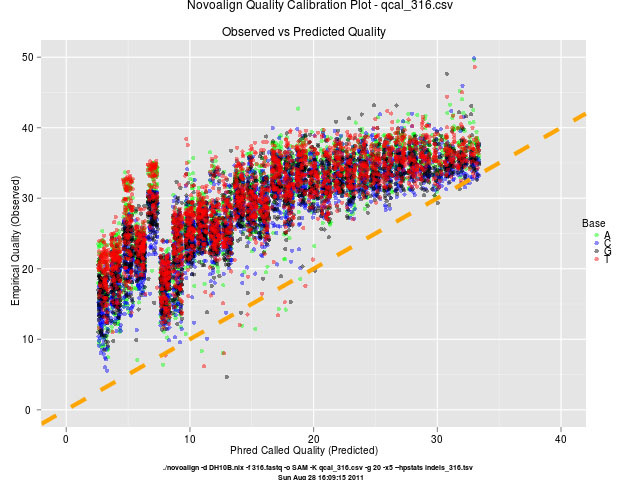 Second, the predicted quality along reads from the 316 data set (Figure below) used by the Illumina MiSeq application note is an unfair and incorrect representation of what is happening. This wouldn’t be a blog post by me if I wasn’t complaining about something… I mean giving feedback 🙂 A slogan that is regularly used by Ion Torrent is how they are “democratizing” sequencing. In terms of releasing data sets and source code they are far ahead of their competitors Illumina and Roche. The above analysis would not be possible without public release of data sets from Life Technologies and also EdgeBio (Ion Torrent Sequencing service provider). Illumina has provided some data sets from their MiSeq. This killed my bandwidth downloading as they forgot to compress the fastq files. What n00bs! When will Illumina and Roche provide more data sets for their competing desktop sequencers? In the case of Roche when will they provide any? Also when will they learn that people outside the major sequencer centers have brains and perhaps they should interact with them every now and then! Despite the great efforts made by Life Technologies, there is still a long way to go in my mind to truly democratize sequencing. For example, early access to new products should be given to labs that are trying to make a difference in society and not just their “special customers”. What better way to promote your technology by showing that a small lab with little experience can get it to work. I am not impressed at all if an experienced sequencing lab can get it to work. Giving these products to just special customers (aka the “big boys”) is NOT democratizing sequencing, it is maintaining the dominance these labs have over high impact publications. Our lab has requested for early access to the TargetSeq enrichment system (not to be confused with the Qiagen SeqTarget junk). Having access to this enrichment would allow us to explore the possibility of diagnosing children with muscular dystrophy more efficiently and help parents, families and carers plan the future natural progression of these crippling diseases. Having early access will give us an opportunity to produce preliminary data for the next grant round. How about helping the “little guy” for a change? In my next blog post of this series I will provide an independent analysis of homopolymers using the data sets above. This will provide further discussion in addition to the great post comparing Ion Torrent and 454 homopolymers from flxlex. This is the final part of the Fundamentals of Base Calling series. In the first part of the series, I covered signal normalization and droop correction. In the second part of the series, I introduced the problem of probabilistic nucleotide incorporation and its effects on the total signal (aka phasing problem). In addition, I briefly covered a dynamic algorithm for phase correction. Here is the source code for the implementation. Sorry it’s a doc file, couldn’t get wordpress to cooperate 😥 In this final part, I will detail the exact challenges faced with improving the raw accuracy of the Ion Torrent. This is an important topic as many know that the overall aim is to improve accuracy but are uncertain what actually needs improving. There is also a Blogtalk radio audio interview on this topic but it is NOT specific on what needs to be improved. Figure 1. A typical time series data extracted from a DAT file for one well. The well specific baseline value was subtracted from all values. There is a noticeable time delay after the two flow changes due to distance from the flow inlet and pH buffering capacity of each well. The reduction in overall flow time without compromising accuracy. This is required such that longer reads doesn’t necessarily mean longer run times. Life Technologies has provided Flow Scripts o the Ion Community such that people with PGMs can experiment with tweaking these parameters. Unfortunately, the software/firmware on the PGM itself is closed source and thus the sampling rate cannot be tweaked by outsiders. 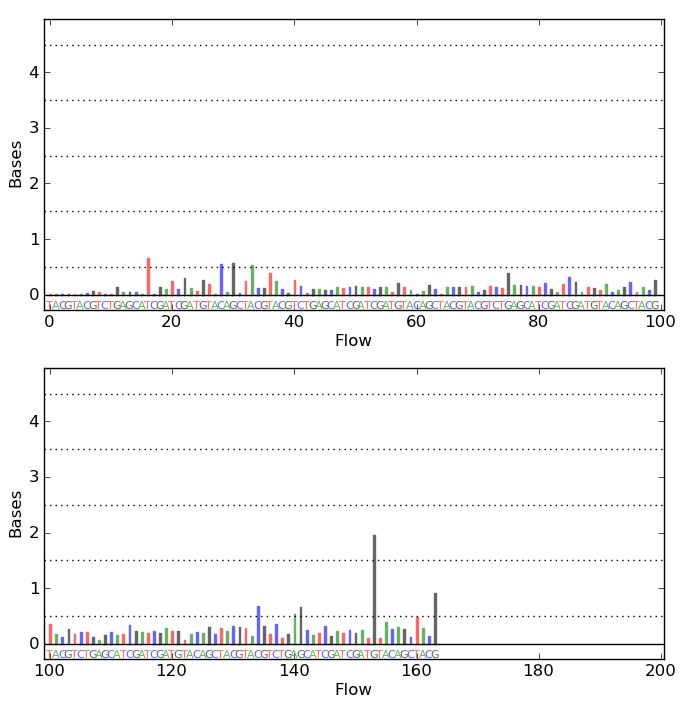 Developers within Life Technologies would have access to sequencing runs where parameters in the Flow Scripts and sampling rates have been tweaked. 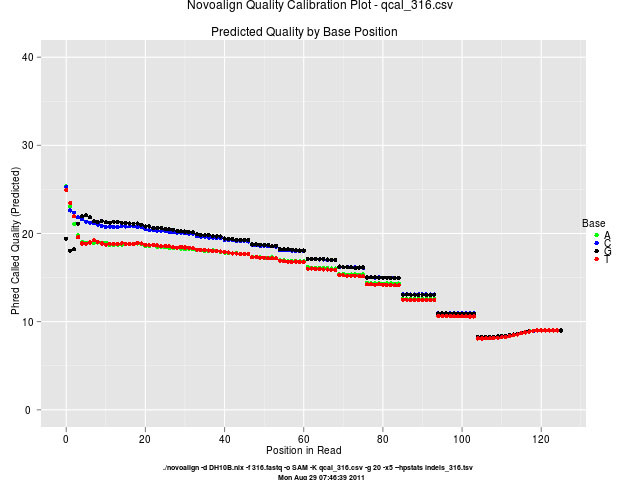 This would be okay IF accuracy challengers were not competing with Life Technologies. The goal of signal processing is to essentially summarize the time series data contained in the DAT files into ONE value. The result of this signal processing is stored in the 1.wells file. This contains for each well, for each flow the signal incorporation value. The file specifications can be obtained from the Ion Community. The goal at this level is to subtract the background signal, leaving only the nucleotide incorporation signal. The figure below shows that the deviation caused by nucleotide incorporation is only slightly larger than the background signal. Figure 2. 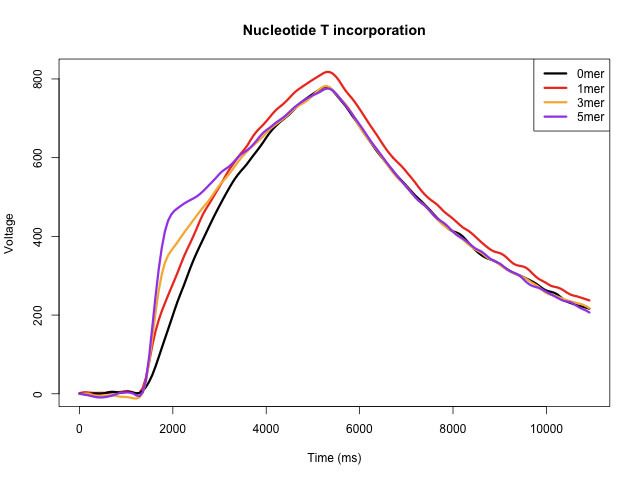 The small changes in the waveform due to nucleotide incorporation. This is an uncorrected signal and thus the 5mer signal does not deviate 5 times the distance away from the non-incorporation response (i.e. 0mer curve). In order to summarize signal to just ONE value, a background and foreground model is currently implemented. The background signal is how a signal would look like if there was no nucleotide incorporation. An obvious observation is that there is variation between flows and well distance from inlet and outlet fluid valves. Therefore, signals taken from surrounding empty wells is the best signal to estimate what the background signal should look like. A multi-parameter model is currently being used in Torrent Suite v1.4. 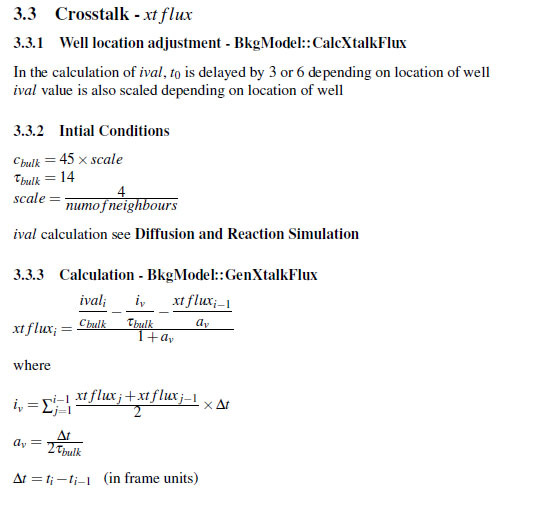 This uses the surrounding empty wells to estimate each of the parameters for the background model. The parameter fitting, which uses linear algebra is the most computationally expensive task in the whole Analysis pipeline. The use of NVIDA Telsa GPU has greatly reduced processing time in Torrent Suite v1.4. A signal incorporation profile is left after subtracting the background. The figure below shows a typical signal incorporation profile. Figure 3. Averaged incorporation signal taken from the summary report for each run. Determined by subtracting the background response. During each nucleotide flow, the polymerase adds nucleotides in a relatively synchronous manner and therefore produces a combined signal for the well observed as a detectable voltage change. What I mean by “relatively” is that most nucleotides are incorporated soon after the nucleotide is flowed in, while some take a little longer to incorporate which is usually the case with the homopolymers . This looks like a sudden spike followed by an exponential decay. 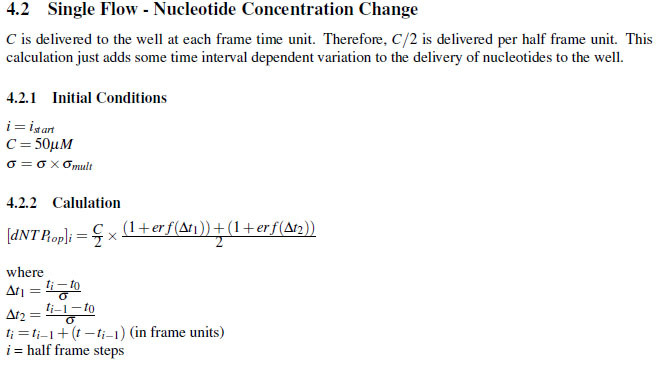 This foreground nucleotide incorporation is modeled as a Poisson distribution using empirically derived nucleotide base (A,C,T,G) specific parameters such as Km values. In an up coming series, I will cover Signal processing in much greater detail. Implementing an accurate and robust Background and Foreground model would be essential to improve accuracy at this level. Others may want to take a different angle on this signal processing but using a background and foreground model is considered best practice for signal processing problems of this nature. The biggest limiting factor of this model is having to use surrounding empty wells to fit the parameters. It makes an assumption that signals from occupied wells and empty wells evolve similarly over time, which includes properties such as variation and noise. In other words, their pH buffering capacity are correlated. The increase in signal residue over time shown in Figure blah in Part 2, shows this assumption may not be correct and must be adjusted. In Parts 1 and 2 of this series, I have discussed the main steps and goals of base calling so no introduction is required. There were three main deficiencies in the current method of base calling which I will now discuss. It is important to note that deficiencies must be addressed at the current level. For example, it is very difficult to address the widening 1mer signal shown for Test Fragment C on the base calling level. This must be address on the signal processing level or even at the chemistry level. The normalization method required estimating a 1mer signal from T, A, C 1mer signals from the key flows. The G 1mer is not included as it is not deterministic whether this is always a 1mer as it is the last base before the unknown library sequence starts. If the library sequence starts with a G then a 2mer would be read for this flow. If the library sequence starts with GG then a 3mer would be read for this flow and so on. Also it is important to note that the 1mer signal is independent of the bases, which could lead to bias in error. The figure below shows that there is a bias when 1mer signals from each base are considered the same. Figure 4. The insertion and deletion counts were from the June cropped data set available on Innocentive. This is from Q10 reads of length greater than 50 bases (207 reads) using a modified alignStats binary. This nucleotide bias was also noted in the Mass Genomics blog post. Another problem is using a 1mer signal to normalize a signal before base calling as there is little room for error when normalizing large homopolymers. For example, a signal between 1.5-2.5 will be called as a 2mer. This requires a 1mer signal between 0.75-1.25. A signal between 2.5-3.5 will be called as a 3mer. This requires a 1mer signal between 0.83-1.16. And so on. This demonstrates the estimate for the 1mer signal needs to be highly accurate for larger homopolymer calls. In other words, the % tolerance decreases as homopolymer length increases. The table below shows the % tolerance for each homopolymer length. This problem is compounded by the increase in signal residue deep into the sequencing runs making large homopolymers difficult to call correctly. The number of bases called for a given flow, is calculated by rounding the signal to the nearest integer. When the value is 2.1, 2.05, 2.2 this is quite trivial as 2 is the closest integer. What happens when the value is 2.49, 2.51 ? In the case of 2.49 this would be called as a 2mer, while 2.51 will be called as a 3mer. However, these two values were only separated by 0.02 and now are separated by whole integers!! The threshold problem is a common problem in statistical classification with many methods to address this. In fact, PyroBayes implements a naive Bayes classifier as an attempt to address the homopolymer problem. Interestingly, earlier version of Torrent Suite have used statistical modeling or machine learning techniques implemented in the WEKA package. In Torrent Suite v1.4, a greedy approach is taken with base calling. There are two types of greedy in this world. Greedy type 2 is the one that is applicable to the base calling currently used on the Ion Torrent. This greedy approach works quite well and is fast and efficient BUT does not go so well with boundary cases such as 2.49 and 2.51. 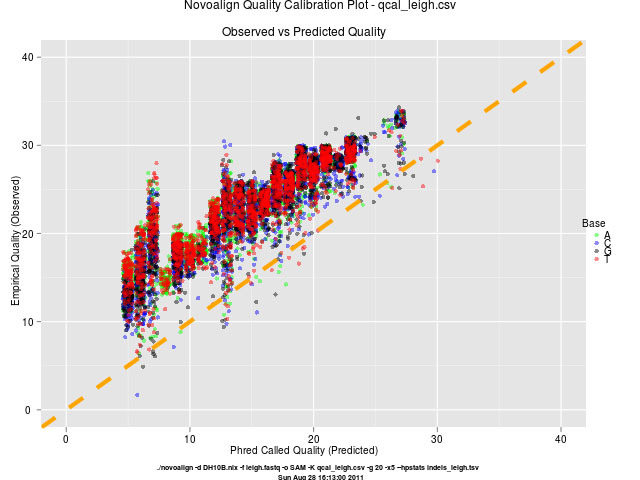 Using a greedy approach results in the classic undercall-overcall or overcall-undercall problem observed in the data, highlighted in the Mass Genomics blog post. For example, if a C 3mer is incorrectly called as a C 2mer, the lagging signal produced may be mistaken for a 1mer in the next C flow. A non-greedy approach would take both paths, that is call a 2mer and 3mer and observe the resulting future consequence in taking both paths before committing to a base call. In this case, future consequence is concerned with reducing the residue signal (i.e. unexplained variance). The goal of a non-greedy approach is to reduce the overall residue and not the residue for any one particular base call. The thesis of Helmy Eltoukhy demonstrated that using a modified Vertibi algorithm (i.e. non-greedy approach) can reduce the homopolymer error in 454 sequencing. This was demonstrated using Markov Chain Monte Carlo (MCMC) simulations. He purposely left out all the important details so like the thesis marker with blind faith we’ll all believe him 🙂 Besides being adapted for base calling, the weakness with the Vertibi algorithm is that it only has a limited memory. 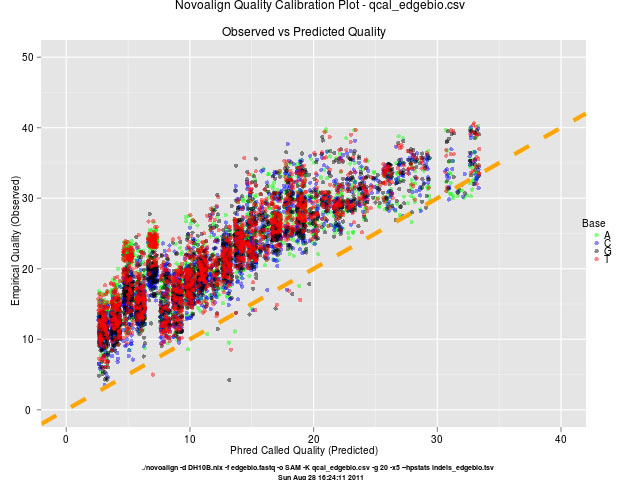 A depth first or breath first tree search of homopolymer possibilities with edges weighted by resulting residue would perform better but its performance is highly dependent on the signal to noise ratio. Currently the major parameters (Droop, Carry Forward, Incomplete Extension) used for base calling are constant and do not change between flows. 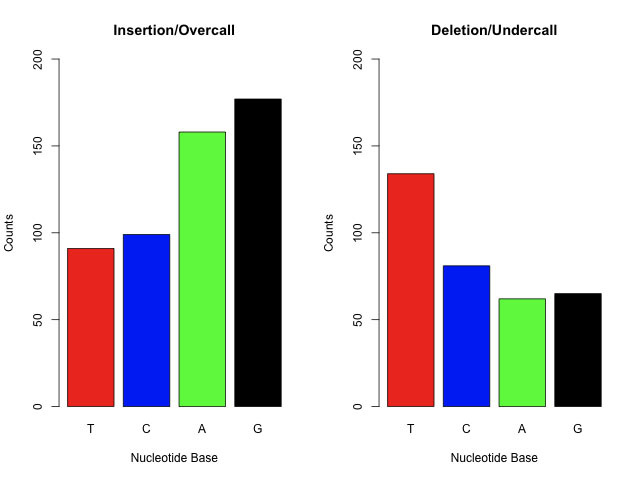 First, these parameters may be nucleotide base specific. Second, they may vary dependent on the homopolymer length. It is intuitive that incomplete extension is more likely for longer homopolymers. Last, the buffering and reagent effectiveness in the well may have changed drastically compared to what they began with during the start of the sequencing. This concludes the Fundamentals of Base Calling blog series. It is extremely important to note that each problem/improvement mentioned is entangled and is highly dependent on the other components. This would suggests a unified model in which signal processing and base calling modules can communicate would be beneficial due to entanglement. Currently the modules only communicate via the 1.wells file, where most of the information is lost due to data reduction. Disclaimer: For the good of all mankind! This is purely my opinion and interpretations. I have tried my best to keep all analyses correct. Care Bears is the best show ever! In part 1, I discussed signal normalization and droop correction. Below is the amount of variation in the signal still left to be explained. Figure 1. 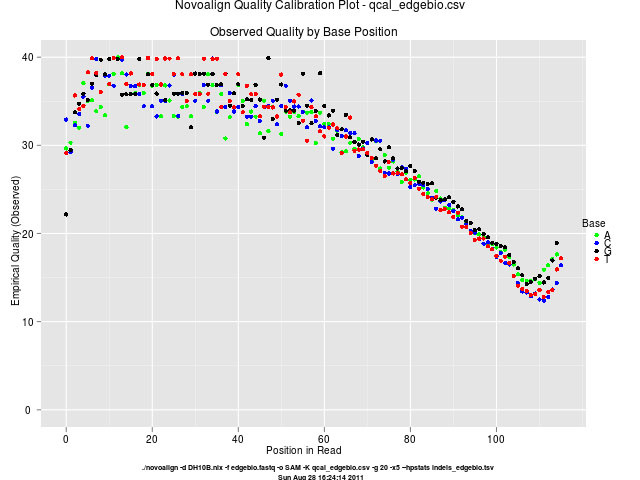 Signal residues calculated by | Normalized Signal – Ideal Signal |. The residues are largest at the 3mers, 4mers and towards the end of the read. There are a lot of journal articles out there that discusses the phase problem in a non-technical way but in order to fully appreciate the problem and to be of any benefit to those who want to improve the Ion Torrent accuracy, it MUST be discussed technically. 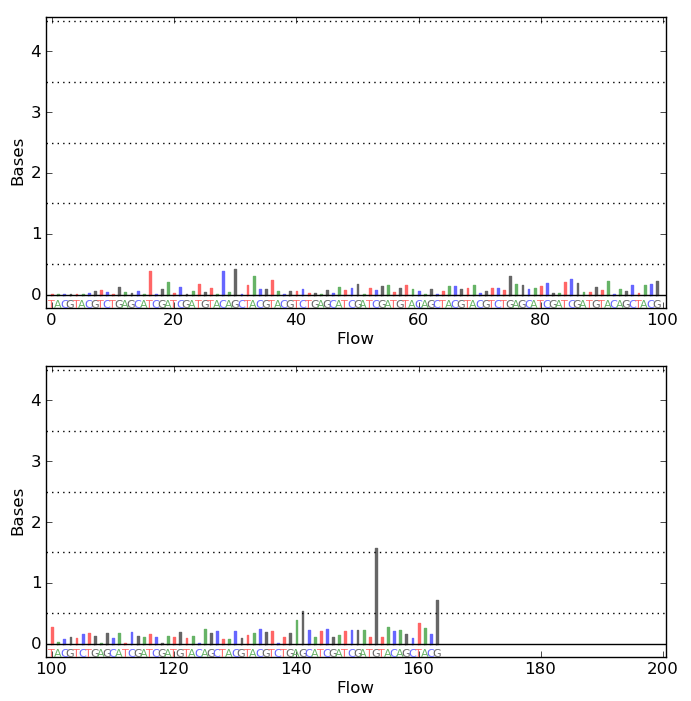 Firstly, the problem of phase correction is not unique to Ion Torrent but is common to all technologies requiring sequence by synthesis, which also includes Illumina and 454 sequencing . What does sequence by synthesis actually mean? In a nutshell it is observing DNA polymerase adding nucleotides one by one, creating the complementary DNA strand. The difference between the technologies is how the observation is made. In the case of Illumina, dye labelled nucleotides (A,C,T,G) are flowed and the polymerase incorporates the nucleotide then a picture is taken after this event. The genius of this technology is the reversible dye used to label the nucleotides. 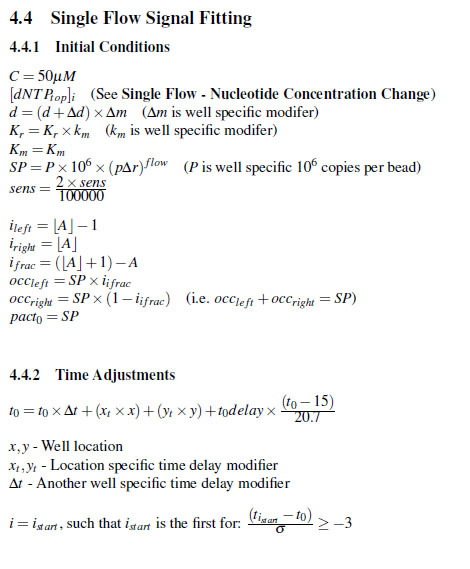 For each flow only one nucleotide can be added and hence removing the problem of detecting whether multiple nucleotides (homopolymers) were added. Unlike Sanger sequencing, the dye can be removed then allowing another dye label nucleotide to be incorporated in the next flow. In the case of Ion Torrent, the nucleotides are not labelled and a by-product of incorporation (hydrogen ions) is detected instead. We know which of the 4 nucleotides was incorporated as ONLY ONE nucleotide is present in each flow. In addition, since these nucleotides are unmodified if you have multiple nucleotides to be incorporated (i.e. homopolymer) this would produce a proportionally larger amount of hydrogen ions. The 454 works on the same principle but a different by-product of nucleotide incorporation is detected. In all three technologies, a large number of identical template strands are concentrated in a small area (i.e. cluster or well) allowing the combined signal from a large number of identical strands to be detected. Finally, the problem itself. For each flow, whether a nucleotide is incorporated is not a deterministic event but rather a probabilistic one. Carry Forward errors are analogous to false positives, while Incomplete Extension is analogous to false negatives. The remainder of the discussions will mainly focus on Incomplete extensions as the contribution made by Carry Forward errors are negligible in comparison. In this sequence there are 8 bases, however the Ion Torrent would have achieved this sequence read, through four positive flows – A, T, C, G flows in that order. 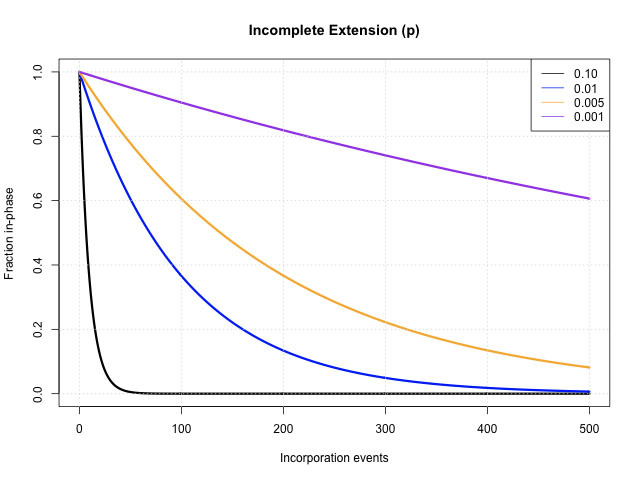 In other words, only 4 incorporation events are needed to produce the above sequence. For Incomplete Extension, we are only interested in what happens during incorporation events (i.e. positive flows). The above figure shows how quickly a sequencing read can rapidly fall out of phase to a point that the lagging fraction (or population) makes up the majority of the signal. To put this in perspective, Test Fragment A requires 72 incorporation events and the error spike mentioned earlier occurs at the 59th incorporation. The approximated Incomplete Extension for Test Fragment A is p=0.012, thus the blue line is the best match for what is happening in Test Fragment A. To achieve longer reads (> 200 bp) the Incomplete Extension value should be much lower and closer to 0.001 (purple line). However, all is not lost if we can get good approximation of the probability of Incomplete Extension then the signal can be phase corrected (aka dephased) by either simulation (Torrent Suite v1.3) or from first principles (outlined below). The first principles method (using dynamic programming) discussed below is from deciphering the work of Helmy Eltoukhy published in IEEE and also in his Stanford PhD thesis. 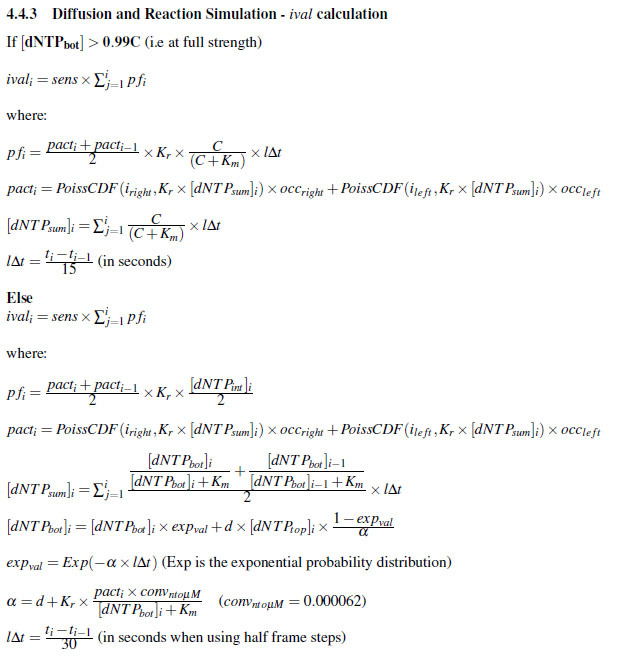 Like all good publications from mathematicians, it is completely incomprehensible! 😦 This is probably why the only referencing an IEEE publication receive from outsiders is when they are criticizing the efficiency of their algorithm 😮 Please appreciate the hours it took me to decipher the incomprehensible but brilliant work of Helmy Eltoukhy. I will use a 4 flow cycle to illustrate how this is performed as this is much easier to understand than a 32 redundant flow cycle. Ideal signal (a) from incorporation events for that nucleotide from preceding flows. Defined by: an-4, an-8, an-12…. Using the value p, we can determine the fraction of strands in the in-phase population and also from the lagging populations (wn-4, wn-8 …). Figure 2. Signal residues calculated by | Phase Corrected Signal – Ideal Signal |. The greatest improvement compared to Figure 1 is the 3mers and 4mers at the start of the read. The residues are still quite high for positive flows late into the read. The phase corrected signal was produced using the following fitted parameters: p = 0.988, ε = 0.0075, droop = 0.00075. The problem now remains to model and account for the remaining residue. This will be discussed in Part 3 of this series along with the dynamic programming implementation of phase correction as C/C++ code.